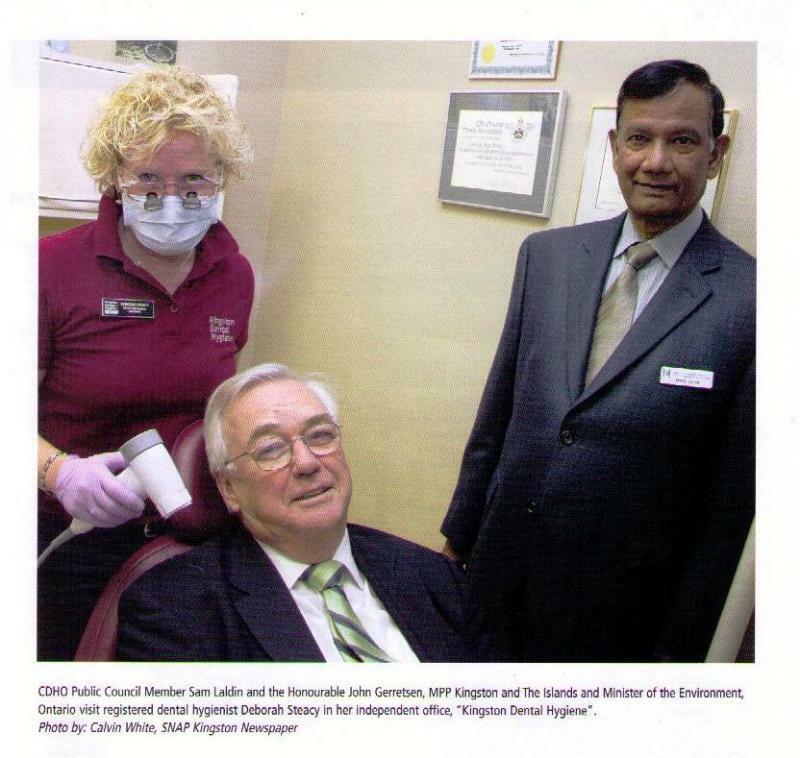 Caption reads: "CDHO Public COuncil Member Sam Laldin and the Honourable John Gerretsen, MPP Kingston and The Islands and Minister of the Environment, Ontario visit registered dental hygienist Deborah Steacy in her independent office, 'Kingston Dental Hygiene'." Caption reads: "Seated left to Right Front Row: Samual Laldin, Public Member Kingston; Shori Katyal, Public Member Toronto;Linda Jamieson, RDH, (Academic) President, Orillia; Adam Esse, Public Member, Mississauga*; Salam Rifai, Public Member, Mississauga; Diane Greenwood, RDH, London; Inga McNamara RDH, Vice-President, Barrie; Tote Quizan, Public Member, Scarborough; Middle Row: Denise Burdon, RDH, Non-Council Member, Newmarket; Anne Venton, Public Member, Toronto; Nancy Kitchen RDH, Belleville; Audrey Kenney, RDH, Non-Council, Burlington; Shirley Silverman, RDH, Thornhill; (multi top- Caroline LOtz, RDH (Academic) London; Heather Blondin, RDH, Sudbury; Julia Johnson, Public Member, Orillia; Heather Murray, RDH, Non-Council, Unionville; Back Row: Carl Barr Overholt, RDH, St. Catherines; SHelli Jeffs, RDH, Non-Council, Bowmanville; Lucy Pavao, RDH, Toronto; Ilga St. Onge RDH, Thunder Bay; Kathleen Ferres Patry, RDH, Kanata; Derrick McLennon, Public Member Scarborough. 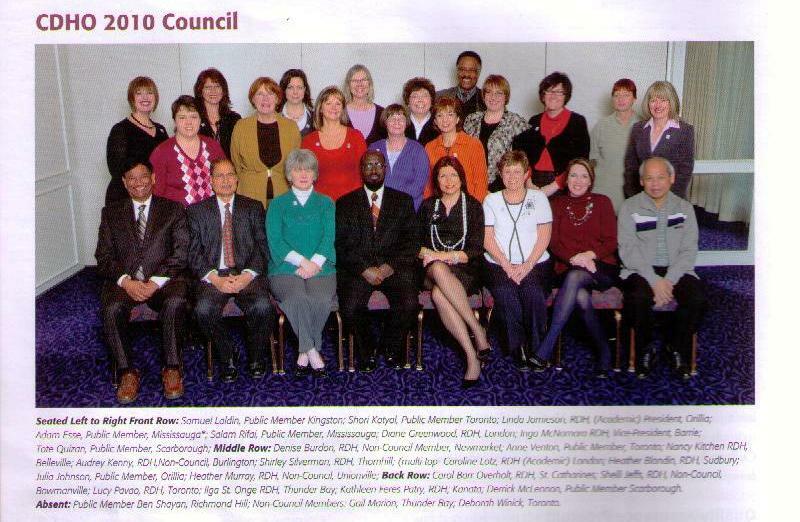 Absent: Public Member Ben Shayan, Richmond Hill; Non-Council Members: Gail Marion, Thunder Bay; Deborah Winick, Toronto." 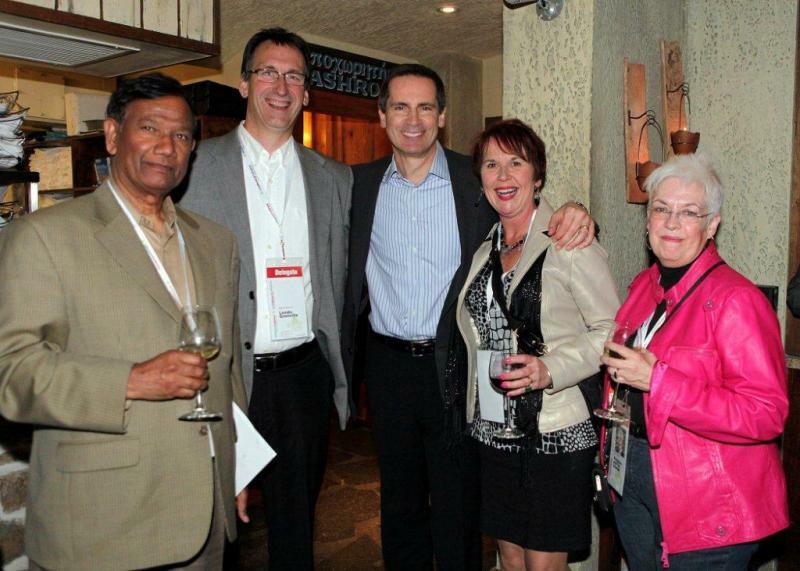 Left to right, Sam Laldin, KIPLA Policy Director; delegate from Brockville; Honourable Dalton McGuinty, Premier of Ontario; second delegate from Brockville; and Catherine Milks, KIPLA President. Sam retired from the KGH before going on to found CCASA. This announcement appeared in the hospital's newletter, Your Write Hand. 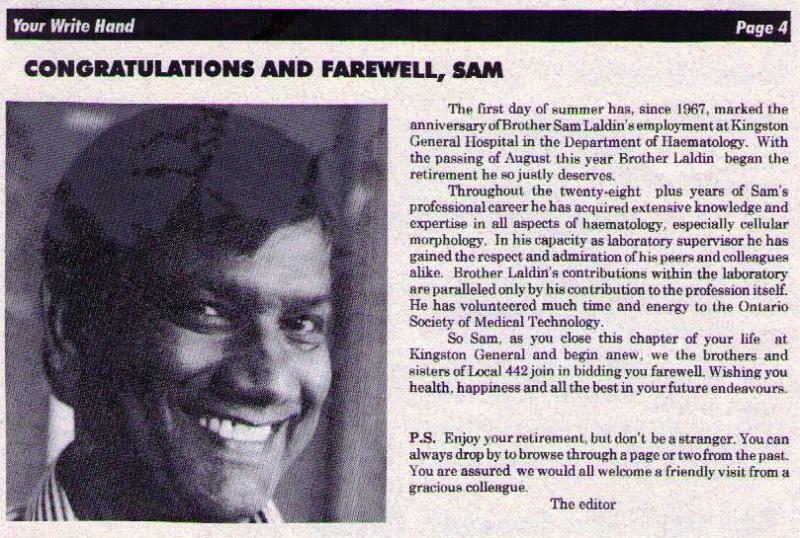 "The first day of summer has, since 1967, marked the anniversary of Brother Sam Laldin's employment at Kingston General Hospital in the Department of Haematology. With the passing of August this year Brother Laldin began the retirement he so justly deserves. "Throughout the twenty-eight plus years of Sam's professional career he has acquired extensive knowledge and morphology. In his capacity as a laboratory supervisor he has gained the respect and admiration of his peers and colleagues alike. Brother Laldin's contributions within the laboratory are paralleled only by his contribution to the profession itseslf. He has volunteered much time and energy to the Ontario Society of Medical Technology. "So Sam, as you close this chapter of your life at Kingston General and begin anew, we the brothers and sisters of Local 442 join in bidding you farewell. Wishing you health, happiness and all the best in your future endeavours. "PS. Enjoy your retirement, but don't be a stranger. You can always drop by to browse through a page or two from the past. You are assured we would all welcome a friendly visit from a gracious colleague.